The Source is having a big daily deals promotion. 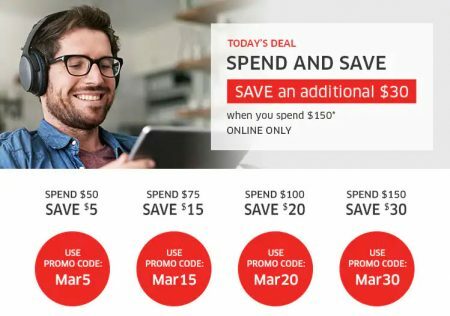 *Promo code is redeemable March 28, 2019 only. No cash value. Online only. Discount applies to one purchase, before taxes and fees. EHF (Environmental Handling Fee) pricing varies by province and will be included (where applicable) when you place your order. Cannot be combined with any other offer. EPP, PSP and Dealer discounts excluded. Discount cannot be used towards purchase of Apple products, Bose products, Sonos, Fitbit, Google products, UE, JBL, Pre-orders, Amazon products, Gaming Hardware and software, Hard drives, Door Crashers, Daily Deals, The Source Gift Cards, all prepaid cards (iTunes, Xbox, etc. ), prepaid airtime cards, digital downloads, mobile phone plans and security deposits. One (1) per customer. Additional conditions, limitations and/or exclusions may apply. For online redemption enter code in promo code box during check out. The sale is available online only on Thursday, March 28, 2019. The Source offers free shipping on online orders over $25 or free shipping to your nearest store for in-store pickup. Click here to shop The Source online now or for more details about the sale. 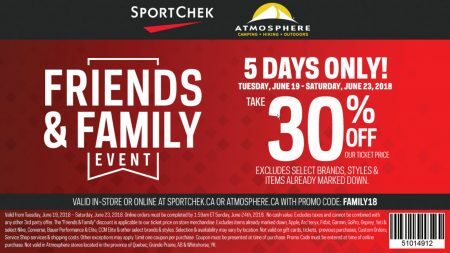 Sport Chek’s popular Friends & Family Event is back! Atmosphere is having the same sale. Take 25% off our ticket price on select brands & styles excluding items already marked down. Take 10% off our ticket price on select brands & styles on items already marked down. The sale is available online only when you enter promo code FF19SPRING at checkout. The sale is available for 5-days only from Thursday, March 21st to Monday, March 25, 2019. Sport Chek is also offering Free Shipping on all orders during this promotion! Today (Friday, March 8, 2019) is Hudson’s Bay Giving Day. In support of the HBC Foundation HEADFIRST program, Hudson’s Bay is committed to improving mental health across Canada. 1% of online sales (up to $10,000) and $5 from the sale of every ticket in store will be donated to WE Charity in support of the WE Well-being program, which provides educators and students with resources to promote positive mental health in the classroom and beyond. The sale is available in-stores and online for 1-day only today (Friday, March 8, 2019). Extra 15% off no matter how you pay (with any tender). Extra 10% off Cosmetics & Fragrances, Confectionery & Gourmet, Furniture, Major Appliances, Mattresses And Mattress Adjustable Bases, Patio Furniture, Personal-Care Electrics, Strollers, Car Seats & Travel, Baby Toys & Activity Baby Feeding, Baby Health & Safety, Bath, Potty & Diapering, Toys No Matter How You Pay. TheBay.com offers free shipping on orders over $99, or $45 with HBC Credit Card. 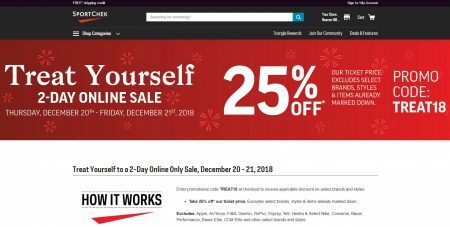 Sport Chek is having a big Treat Yourself Sale! Take 25% off + free shipping on all orders when you enter promotional code TREAT18 at checkout! Excludes select brands, styles & items already marked down. The sale is available online only for 2-days from Thursday, December 20th to Friday, December 21, 2018. Take 25% off* our ticket price. Excludes select brands, styles & items already marked down. Excludes: Apple, Arc’teryx, Fitbit, Garmin, GoPro, Osprey, Yeti, Hestra & Select Nike, Converse, Bauer Performance, Bauer Elite, CCM Elite and other select brands and styles. Valid from Thursday, December 20th – Friday, December 21st, 2018. Online orders must be completed by Saturday, December 22nd, 2018 1:59AM ET. Sport Chek is currently offering free shipping on all orders during this promotion. Last Chance Reminder: I first blogged about this deal yesterday. Here’s a reminder that the promo code expires tonight at midnight. This is a very popular deal so don’t miss out! 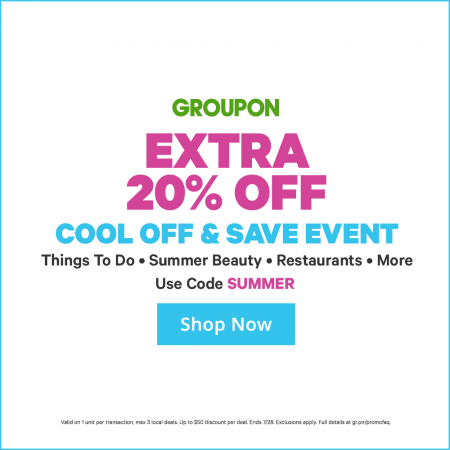 Groupon.com is having a Cool Off and Save Event! Save an incredible extra 20% off Local deals when you enter the promo code SUMMER at checkout! I’ve tested the code and can verify that it works. This promo code is valid for 2-days only from Friday, July 27th to Saturday, July 28, 2018 at 11:59pm PDT. This is going to be a very popular offer so don’t miss out! Sport Chek’s popular Friends & Family Event is back! Take 30% off the ticket price on select brands & styles excluding items already marked down. The sale is available for 5-days only from Tuesday, June 19 to Saturday, June 23, 2018. If you’re shopping online at SportChek.ca, you’ll need to enter the promo code FAMILY18 at checkout. Take 30% off our ticket price on select brands & styles EXCLUDING items already marked down. Excludes: Apple, Arc’teryx, Fitbit, Garmin, GoPro, Osprey & Select Nike, Converse, Bauer Performance, CCM Elite, and other select brands and styles. Valid from Tuesday, June 19th – Saturday, June 23rd, 2018. Online orders must be completed by Sunday, June 24th 1:59am ET. Sport Chek offers free shipping on orders over $50. Chapter Indigo’s popular 15% Off Weekends Promo Code is back! Save 15% off regular priced toys, home décor, fashion,paper and more when you enter the promo code LUCKY15 at checkout. The offer is valid online-only from Thursday, March 15 to Sunday, March 18, 2018. Offer valid March 15, 2018 – March 18, 2018 at indigo.ca on eligible regular priced item(s). Excludes books, eBooks, electronics and related accessories, American Girl® (other than Wellie Wishers™), LEGO®, Shinola, Kate Spade New York, and Benefit Cosmetics products, gift cards, irewards memberships, and Love of Reading products and donations. Not valid on previous purchases or in conjunction with other offers. Chapters Indigo offers free shipping on orders over $25. Click here to shop Chapters Indigo online now or for more details about this sale. WagJag.com is offering an extra 15% off promo code this weekend. 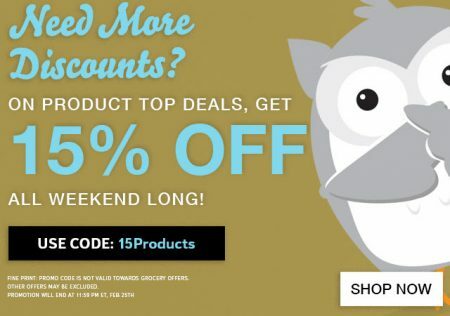 Save an extra 15% off on top products sitewide when you enter the promotional code 15Products at checkout. The promo code is valid until Sunday, February 25, 2018 at 11:59pm ET. This is a hot deal! Groupon.com is offering an extra 25% off promo code! Take advantage of this deal since Groupon rarely offers 25% off codes (their biggest discount code). 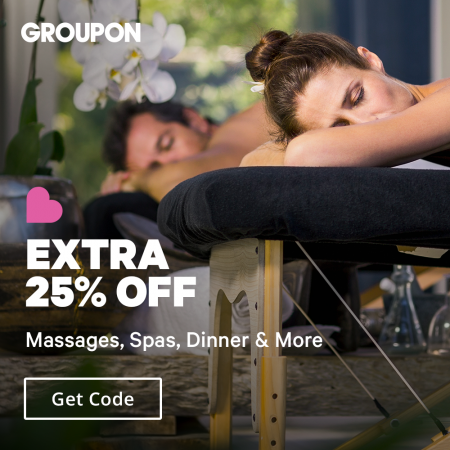 Save an extra 25% off massages, spas, dinner and more on Groupon when you enter promo code VDAY25 at checkout. I’ve tested the code and can verify that it works. This promo code is valid for 2-days only from Friday, February 9th to Saturday, February 10, 2018 at 11:59pm PDT. This is going to be a very popular offer so don’t miss out! This is a hot deal because most of the deals featured on Groupon is already discounted 50-90% off. You’ll find lots of amazing deals with the extra 25% off (sale on sale).